I’ve been quite dormant of late, partly due to getting married and partly due to a fractured wrist which I received on honeymoon.I sustained the fracture as a result of a road traffic accident. I’ve been given the green light by my doctor to return to work and more importantly get some hiking done. The weather over the past week has been really good and I wanted to make the best of my last few days off. 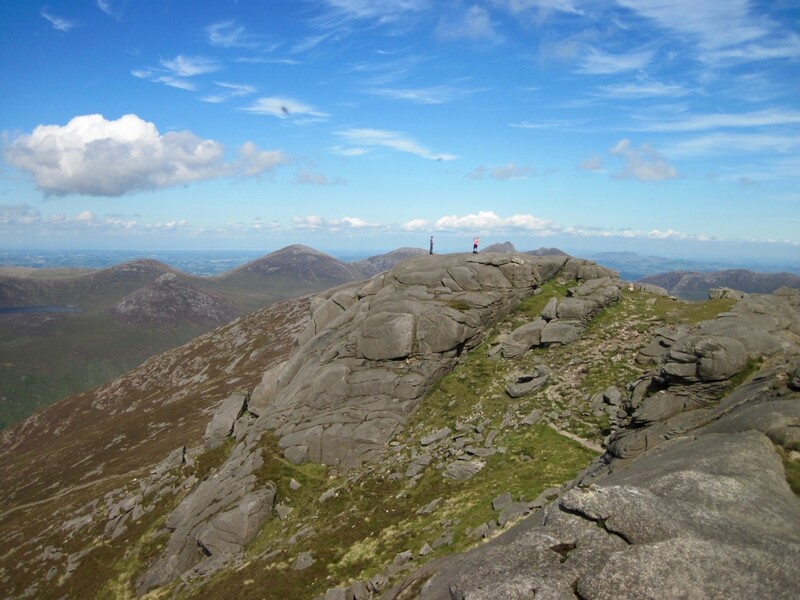 My wife Anne would be joining me on this hike so with that in mind we decided to climb Slieve Binnian (747M), “mountain of the little peak” where last June I proposed to her on the summit. We rose early and made our way along the coast road past sleeping Newcastle with an amber glow of the sun rose behind us. The day was warm and without a breeze, not ideal conditions for walking. Nonetheless armed with suncream,suitable clothing and midge head nets we stepped onto the Carricklittle track. The Carricklittle track borders Annalong wood – a favourite camping spot for those who have only enough time to fit in a quick overnighter. Crossing a stream in Annalong valley. If you’ve never walked along the valley track the view towards the inner horseshoe of mountains such as Binnian, Lamagan and Commedagh is nothing short of breathtaking. These mountains act like a fortress of stone guarding the majestic beauty like a secret only to those who venture into this realm. Towards Percy Bysshe outcrop and cave we crossed a mountain stream which had a swollen carcass of a sheep fermenting. 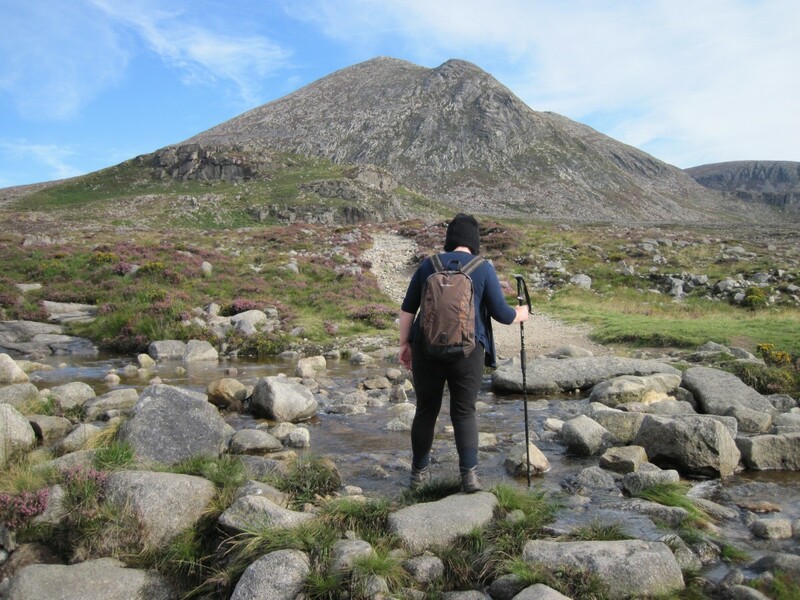 I carry two litres in my bladder pack and either carry my Water-to-go or my Lifestraw which is very similar to the Water-to-go. I also carry water sterilising tablets. Reaching the Binnian / Lamagan col we stopped for a brew and to admire the view across Ben Crom reserve. Local legend tells that C.S Lewis wrote the first words of “The Lion,The Witch and the Wardrobe” from this very spot. It all gets a bit steep after the col. I always carry a flask of tea with me as I’ve something of an addiction to any sort of tea/coffee. More than anything it felt great to be back in the mountains again. After nearly three months of not been able to go hiking I was starting to get ‘cabin fever’. From the col towards the North tor the ascent rises very steeply indeed, some 350 M in a very short distance. I often thought this terrain reminds the walker that they are on a wild mountainside and not a pubic park. Normally we would follow the track around the North tor but on this occasion we decided to have a wee scramble between these giant granite boulders. Far below lies Binnian Lough which on such a still day as today should be avoided due to explosion of the midge population. Binnian lough and Annalong valley. Having gained some altitude we were rewarded with a cooling breeze which help dry the sweat on our backs. 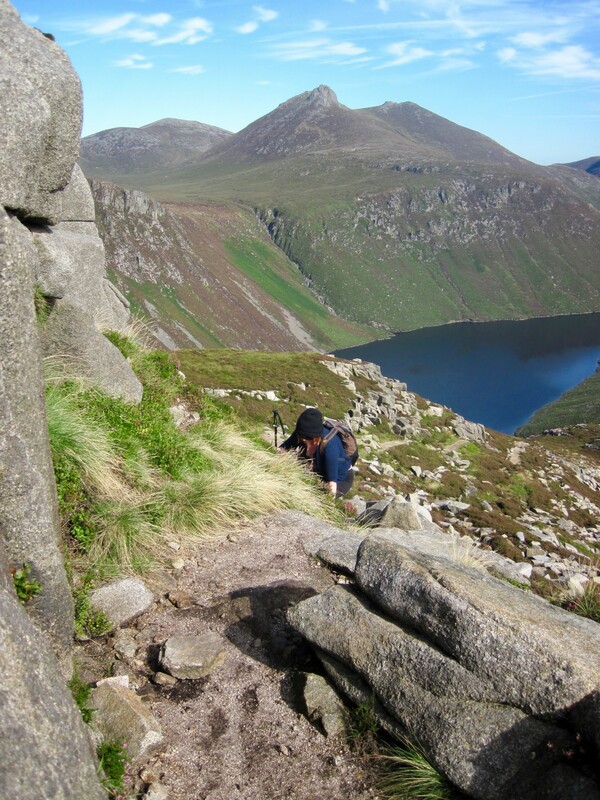 The ridgeline approach to Binnian’s summit is like the spine of a dragon jarring through the surface of mountain. The actual name for these granite rock formations are the ‘Back Castles’ but I prefer the metaphor of the dragon. 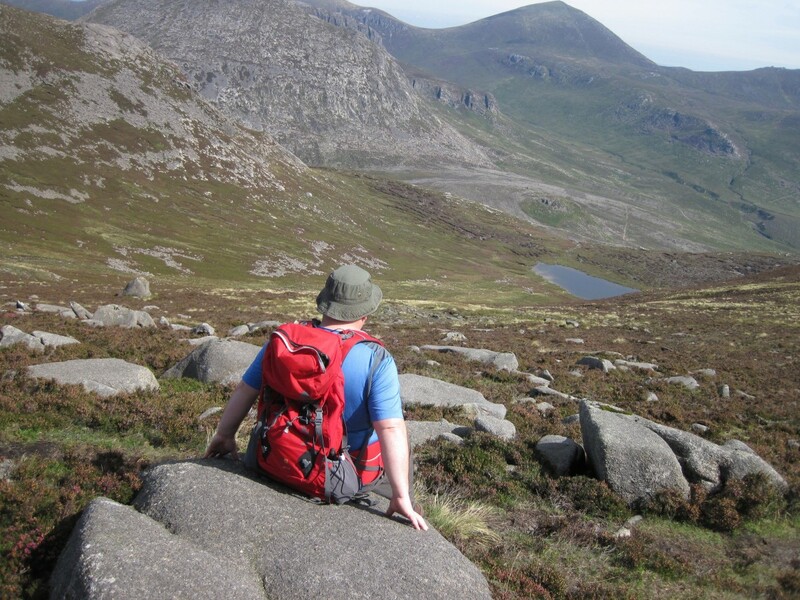 The last approach to the summit is quite gentle with views right across the Mourne Mountain range. As we made our way towards the huge summit tor we decided to clamber through the narrow gap so we could truly say we climbed to the very top. This massive pile of granite strangely has old boundary posts crossing right over and down the rock face. This only leaves me to envision two brothers fighting over which side of the mountain belonged to who. 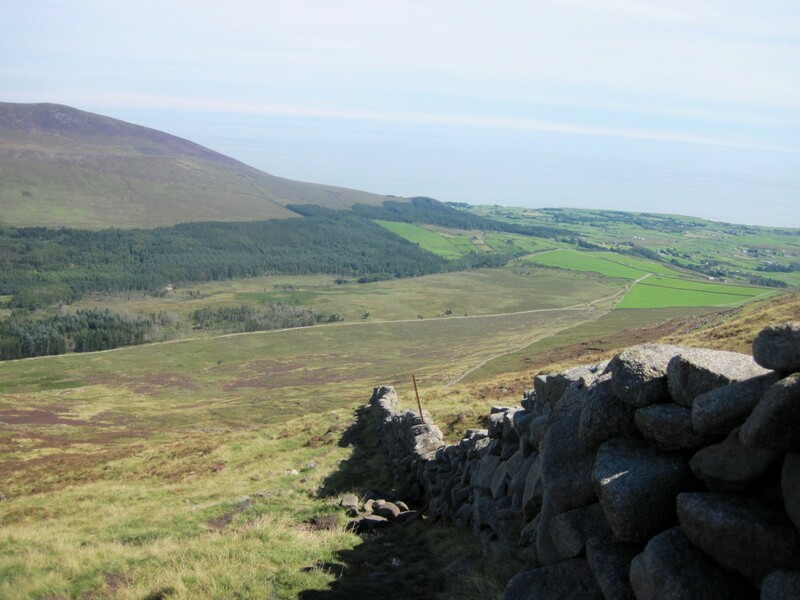 On a clear day you can see as far as the Wicklow mountains and the Isle of Man. A grand view from the summit. The summit also served as a great spot to grab some lunch and observe all the network of tiny fields and houses below at sea level. Slieve Binnian was quite busy, not surprising giving the good weather. 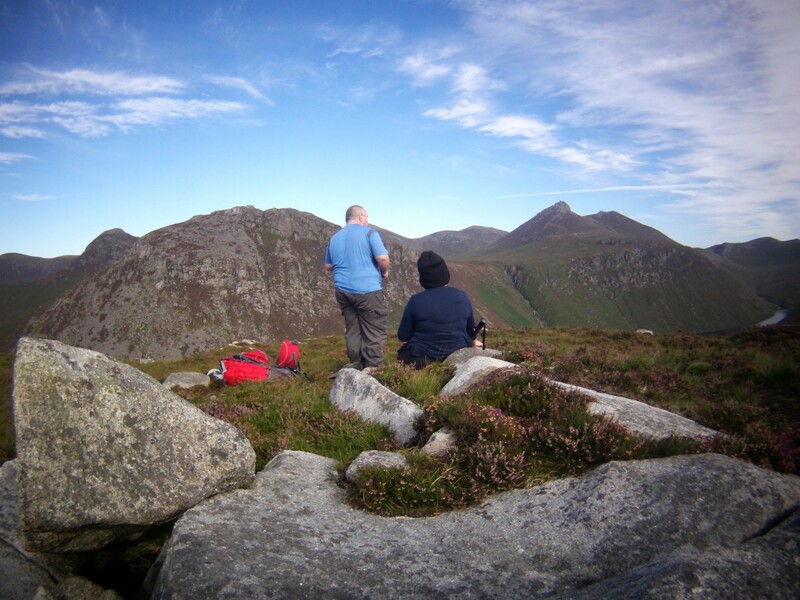 There seemed to be large groups – possibly Duke of Edinburgh – loaded down with heavy packs and tired feet as well as families enjoying the best of the weather. A large raven circled us from above hoping to gather the spoils of our lunch, sadly for him I didn’t leave any trace behind. The descent along the wall towards Carricklittle is less rocky than the ascent from the North tor, but care is still needed as the terrain can be quite boggy underneath. We met several people on the way down greeting them with, ‘Not far to go now’ as we went. We reached the Carricklittle car park some five hours later having taken our time to soak in the splendour of the area. More than anything we had awesome day in the mountains and it felt great to be back out hiking again.